PERFECT SPEED TRAINING SET- We offer a perfect solution for agility training, which contains 15' long agility ladder, 12 heavy duty rungs, 4 d-rings or metal stakes, and 10 EXTRA disc cones. All these make our speed and agility ladder effective for in-depth training. MULTIFACETED - The rungs are flat and highly adjustable such that the ladder spacing can be adjusted to meet a wide range of speed training needs. The disc cones too can be used to design many different speed drills making this football agility ladder suitable for all kinds of sports. PREMIUM QUALITY - Our speed agility ladder is made up of heavy duty straps so that it does not fray. It also boasts high quality plastic rungs which are unbreakable and made to stay firm on the ground. Also, the metal pegs can be used to further secure the ladder. 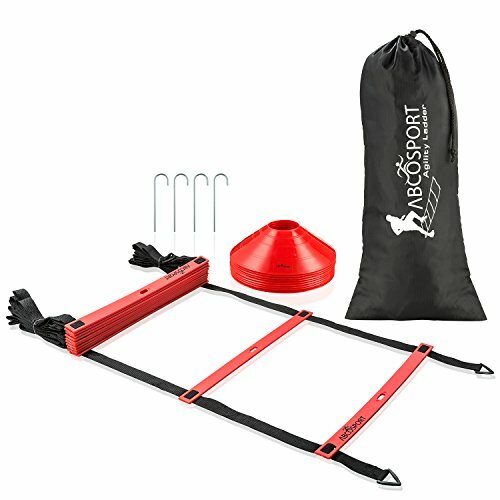 TRAIN AT YOUR BEST SPOT - The best part is the agility ladder can be folded compactly and easily packed inside a bag that comes along with the set. This enables you to carry the quick ladder anywhere you want to train - why not continue training even when away from home?